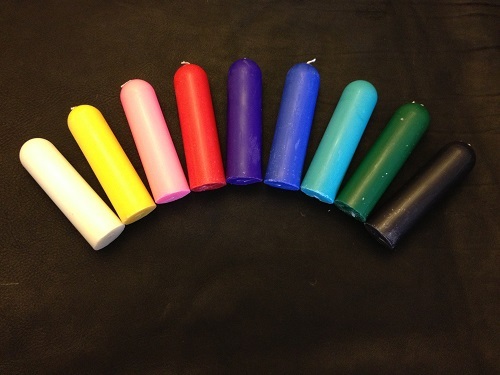 Check out our wax play candles here. Different types of candles produce different temperatures of wax that can range from warm and soothing to dangerously hot wax. Some people can tolerate more heat than others and different parts of the body will be more tolerant than others. Remember that wax can cause serious burns. When pooled it will concentrate heat. The sort of wax candles you are going to find in your high street shops are Beeswax,Paraffin wax,Soy bean wax,Crystallizing wax, Gel wax. Paraffin for example has a melting point between 130-150 degrees fahrenheit and you should be looking at the lower end. Paraffin candles tend to be the cheap candles you buy in most hardware shops. If they have been molded into fancy shapes then they will have a higher melting point and so keep in mind that your wanting cheap, plain and simple paraffin candles. Stay away from taper candles as they melt at around 160 degrees fahrenheit. Soy bean comes from the oil of the soy bean and is a soft wax that normally comes in containers. In its natural state it has a melting point of around 130 degrees fahrenheit but when manufactured it often has other additives added that will heighten the melting point. You can make pure soy bean candles but leave out the fragrances. Gel Wax has a melting point of 94 to 104 degrees Celsius. Will not set as a wax and so not suitable for wax play. Crystalizing wax has a high melting point as well as many additives and so again not suitable for wax play. Stay away from fancy candles, sparkly candles which often contain glass and metal and plastics. Although there are many web sites that repeat the same advice that color additives make candles burn hotter, actual experiments performed by two different researchers show that this is usually not the case. Whenever I make my own candles or melt wax in a crock pot I add color with Crayola crayons. Crayola crayons have a very low melting point and are made from plant extract which is safe on a child’s skin. With wax play you are going to have an open flame and so you need to take some precautions. Make sure you have a fire extinguisher or bucket of water close at hand. Keep some burn dressings in your first aid box and make sure you don’t have any flammable materials close by. Always make sure your candles have a stable base, preferably on a metal tray and that the tray or base of the candle is not in a position where it can be knocked over. Never take the candle too close to the head as hair will ignite and make sure the reciever is not tied down. I am always especially careful not to have my receiver in an upright position because the flame travels upwards and in the upwards position if the hair was to ignite then the head would have a wick effect. Make sure you have plenty of light and so you can see how much is coming out of the candle. It is very easy to pool hot wax when you can’t see what your doing. You are also going to need a largish cover for your subject to lay on as you need to protect your carpet. A cotton shower curtain is good for this. Before play commences test the candles on your own skin. Hold the candle at arms length and drip the wax onto the back of your arm. Now try the wax on the inside of your arm where the skin is much more tender. If it feels too hot at this distance then you probably have the wrong wax. A good position to start with the receiver is with them laying on the floor and you standing astride them. Light the candle and let it melt for a few moments before turning the candle on its side. You should be far enough away from the receivers skin that the heat is not going to be too intense but remember there is a significant difference between an individuals heat tolerance. Wax loses its melting temperature by around 5 degrees for every meter it drops. Watch his reaction and start to move in closer but don’t get carried away. Burns from wax will appear in small to large blisters but not immediately. The more you drip onto the same area, the more intense the heat will become, even if you let the wax set before more drips are applied. You can combine wax and ice for further sensations. For this you will need a crock pot and a slow burner to melt the wax. I always use wax beads for this and combine it with color and mineral oils to make the melting temperature lower. You will need to stir the wax as it melts or it will end up lumpy and once melted you need to immediately remove the source of heat because wax has a tendency to burst into flames if it becomes too hot. As it cools keep stirring and testing drops on the front of your arm. The wax is cool enough to apply when you can run your hand around the crock pot and just about hold the wax in your hand. Take a handful and quickly smear it onto the skin of the recipient. The more you spread it out the quicker it will cool down but it will still make the recipient take a sharp intake of breath. Wax painting came to me through trial and error of experimentation and I have found two ways which work well. One of the reasons I love wax painting is that it gives my artistic side a chance to be unleashed and the recipient finds it very spacey. Some have said it feels as though they are being branded. The first way you are going to need a small crock pot of melted wax or if you want various colors you are better to melt the wax in an incense burner. Use beaded soy bean or paraffin wax as this melts more uniformly. You will need various sized artist paint brushes that are made of man made materials. Don’t use nylon brushes as they will melt and burn the skin. Once the wax has melted then use it like you would any other paint. You have to work fairly quickly because the wax will set fairly quickly onto the brush. Don’t worry if you start to get a build up of wax on the brush. The other tool you can use to apply the wax is the thin end of the handle of the brush but this will be more a close dripping effect. The other way is a packet of crayola crayons a caramel burner and a plate. This is best done sat astride your subject with the plate sat to the left of you. You can keep the burner lit on a low setting, making sure you have situated it safely where it can’t be knocked. Sit it on the plate along with your crayons. I would normally start by drawing a pattern or picture onto my subjects back with a pen. Take the desired color and melt the tip in the flame. Immediately put it onto the skin. It will feel hot but only for the briefest moment. Remember that crayola has a very low melting point. You need to dot it onto the skin and not try to crayon it on. You will normally get around 3 to 4 dots for every hit. Wax will stick to any hair and so it is either better to shave the area to be waxed or avoid that area altogether. When you smudge wax on you tend to be able to peel it off in one go and have a perfect impression of the part of the body you have waxed. You can add oils to the skin before wax play and this will make the wax slide away like butter or you can leave the skin untouched and allow the wax to set firmly to it. This is where you use your imagination. You could scratch it off with the nails or peel it off with a knife but whatever you do, don’t put the recipient in the shower and expect it is just going to fall away. Wax can be messy to get off and it does have a tendency to stick to carpets and clothing. Washing machines and drains are very unforgiving when they get stuck up with wax and so make sure you get as much off as possible before showering or washing garments.